Nine Iranian nationals were arrested in a joint operation carried out by the Sri Lankan Navy, Special Task Force and the Police Narcotics Bureau (PNB) in the seas off the Southern Coast, STF Commandant Senior DIG M. R. Latiff confirmed. “The Iranians were arrested after law enforcement officers intercepted a trawler that had been laden with narcotics. This was a consignment that Makandure Madush had arranged prior to his arrest in Dubai,” he told the Daily News. The drugs haul shown to media. Picture by Chaminda Niroshana. Around 500 kilogrammes of heroin had been reportedly thrown overboard when the Iranian nationals realised that they maybe arrested. Officers managed to confiscate 100 kilogrammes. “The suspects and the trawler were brought to land,” according to the Police. The STF intelligence units have revealed that this consignment was being transported to Sri Lanka, Seychelles and the Maldives from Pakistan. “However, security units were able to seize only 100 kilograms out of the entire haul as the suspects had thrown the balance 500 kilogrammes into the sea when the raid was conducted,” Latiff said. The Police units had boarded the trawler undercover. Senior DIG Latiff also revealed that the seized trawler had been anchored at the Karachi Harbour in Pakistan a few days ago and the Pakistani drug smugglers had loaded this heroin haul into the trawler there. However, the STF’s international intelligence units have revealed that these drugs had been transported to Pakistan from Afghanistan using small boats nearly one week ago. The Police units had been gathering information regarding the orders made for these drugs by local smugglers and the raid was conducted in the local waters as the smugglers had planned to bring them to another country as well,” Senior DIG said. 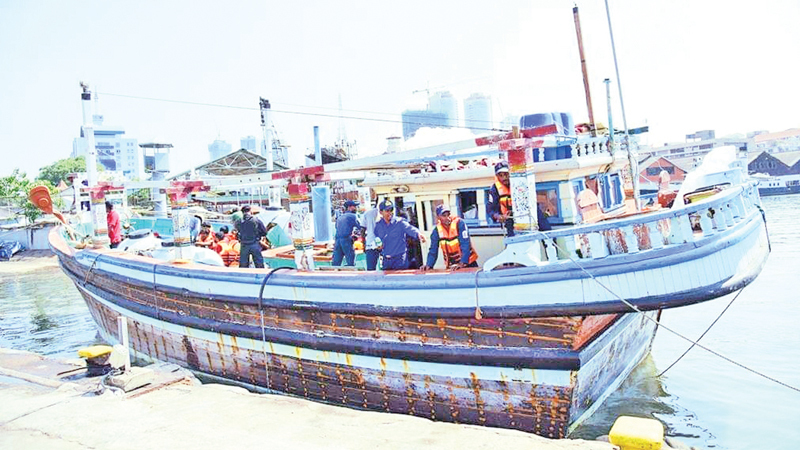 The seized trawler was brought to the Colombo Port from the Southern Seas around 2.00 p.m. yesterday. Meanwhile, Police sources revealed that the tip-offs for the recent large scale raids conducted regarding heroin busts including yesterday’s one were from the same Inspector of Police, who is attached to the STF Intelligence Unit. The recent largest haul found in Sri Lanka involving 294 kilograms and 490 grams of heroin was seized by the STF and the Police Narcotics Bureau (PNB) in the Kollupitiya area on February 23. 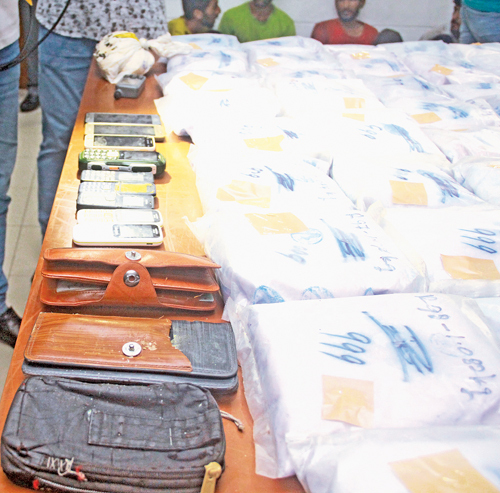 Before that, on December 31 last year, Police seized 272 kilogrammes of heroin and five kilogrammes of cocaine at a housing complex at Mount Lavinia worth over Rs. 2.4 billion, another 231 kilogrammes of heroin worth Rs.2,778 million from the Beruwala seas in the same month and 261 kilogrammes of heroin hidden inside a container in August 2013. In addition, small raids are also being conducted by the STF and the PNB constantly. In 2018 the Indian Ocean team of the Global Maritime Crime Programme observed an increase in both the amount and types of maritime crime occurring within Indian Ocean. This includes the trafficking of Afghan heroin originating from Makran coast in Pakistan and Iran.